This example is for a professional with experience as field marketing manager and sales representative handing events and branding for products. This document provides a good general reference for professionals seeking positions in marketing. 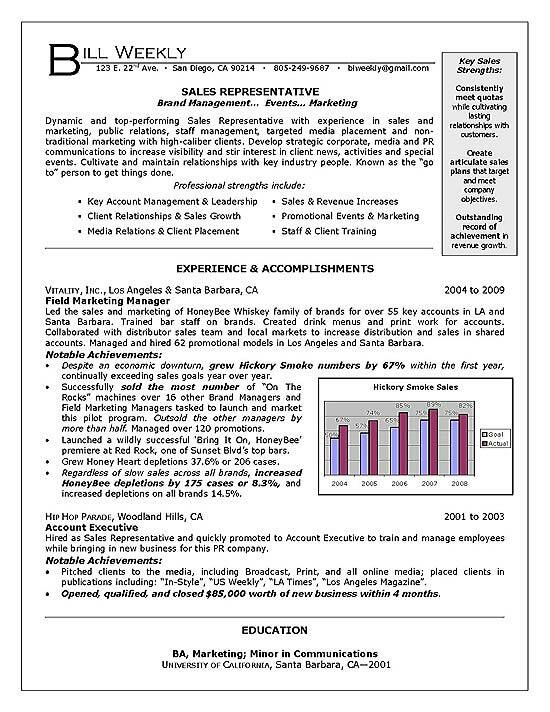 The marketing resume opens with a paragraph summary and headline statement. The job seeker outlines multiple qualification highlights including: account management, brand management, client relations and media relations. Specific marketing skills include sales growth, promotions, events, product marketing and training. The experience section outlines responsibilities and notable achievements. The accomplishments include growing sales numbers, overseeing successful product launch event and creating new business. Additional Comments: Client wanted focus of resume to highlight exceeded sales goals as the only brand being sold that surpassed expectations. The graph was added for impact to further highlight these marketing achievements. The job seeker has a Bachelor or Arts in Marketing with a Minor in Communications. Create, launch and manage customer development and cooperative marketing program. Manage daily program planning and deployment of marketing activities. Oversee vendors to ensure objectives are met within budget. Lead development of marketing launch plans in collaboration with sales and marketing staff. Foster online communications by working within the web site and social media platforms. Manage customer database with profile information, order data and contacts. Publish press releases and work with public relations to help market new products. Create promotional calendar working with vendors to design presentations and demonstrations. Handle customer services, resolve client issues and extinguish escalated complaints.